Everything God does is for one purpose, and that is His glory. The bible tells us that the heavens are telling of the glory of God (Psalm 19:1-2). The celestial bodies of the universe are put into place and exploding with unimaginable energy for the purpose of glory. As we look upon the stars at night and our sun in the day, they are declaring to us in their speech that God is glorious. At the end of the age, when all is said and done and we bask in eternity, God promises that the earth will be filled with the knowledge of the glory of the LORD, as the waters cover the sea (Habakkuk 2:14). The most significant human being to walk on this earth, without question, is Jesus Christ. He is significant because He is God in the flesh. And, as God in the flesh, Jesus is also radically passionate for God’s glory. In the beginning was the Word, and the Word was with God, and the Word was God. And the Word became flesh, and dwelt among us, and we saw His glory, glory as of the only begotten from the Father, full of grace and truth (John 1:1, 14). 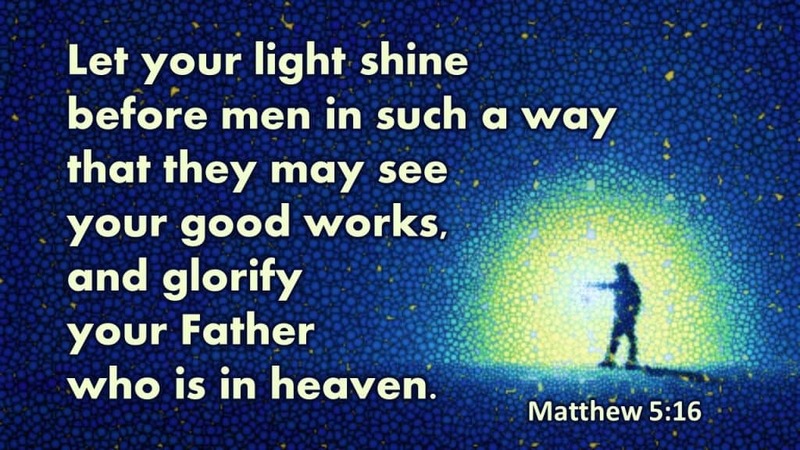 Jesus tells His disciples that He seeks God’s glory in all that He does (John 7:18). Jesus said He dies on the cross, enduring it’s cruelty and shame to the point of death, for the purpose of God’s glory (John 12:27-28). Every act, word, and moment of the ministry of Jesus is for the purpose of glorifying God (John 17:4). Jesus came to save sinners. Jesus calls us. We are called by God’s name and created for His glory (Isaiah 43:7). Our sins are forgiven for His glory (Isaiah 43:25). The aim of our salvation is that we see and enjoy God’s glory (John 17:24) and praise His glory forevermore (Ephesians 1:12). Let’s let these truths sink in for a moment. The teaching of Scripture is that all these events as well as every second of every historical event on earth has one purpose and that purpose is to make God’s glory known. Do we believe and therefore live with this truth as a guiding principle? Do we believe and therefore live with this truth as a guiding principle for our lives? If we believe it is true, shouldn’t this truth impact the way we live? If everything in Creation exists for God’s glory, doesn’t that mean that we also exist for God’s glory? After all, if we are to be conformed into the image of Jesus Christ, who does everything for the glory of God, shouldn’t every thought we think, every word we speak, and every act we do be for the purpose of glorifying God? If we are being conformed to the image of Christ, then the glory of God is our primary concern. We are created and creation exists for His glory. But how? How do we conform our lives so the purpose of our life is in harmony with God’s purpose? What steps do we take? The main idea of the message today is this: Find joy and purpose by submitting to God’s will for your life and live for His glory. The Bible teaches that when we live in harmony with the will of God and when our purpose in life aligns with His, we obtain great joy and fulfillment. Life will have meaning and purpose. We will have the peace that passes all understanding. We will understand how to persevere through difficult times. We pray for God’s kingdom to come and God’s will to be done. We must live our prayer. This message proposes four ways which we may glorify God as those who put their faith in Jesus Christ. There are many Scriptures for each point. What I’ve done is selected one verse for each point which best describes and illustrates the principle. First, we need to glorify God in faith. We need to trust Him completely. The verse chosen for this point is about Abraham. Abraham glorifies God by recognizing God is to be believed. Abraham hears what God says, God’s Word, and Abraham is fully assured that what God promises. By faith, Abraham believes God is able and will make His promises happen. Abraham believes God will make of his ancestry a mighty nation; therefore, Abraham, by faith, is willing to sacrifice Isaac on an altar. He is willing because he believes God will raise Isaac from the dead. Abraham is fully convinced God will do as He says. As those who are in Christ, we glorify God when we believe His Word just as Abraham. The attitude of a God glorifying Christian is an attitude born out of a fear of God, a reverence for God’s power and character. We begin by believing God exists. We have a “fear of God,” and believe what God says is true. We observe and understand and embrace the truth that there is a Creator worthy of our allegiance. He is worth listening to because He is right. He is worth obeying because He is good. His ways are perfect. The fuel for our faith is the Word of God. The Bible says that faith comes from the Word of God. God’s Word helps us to gain knowledge of God and exercise faith in circumstances and events. We grow in knowledge of how to trust God in all things. We glorify God when we trust Him in stormy times. When life gets hard, we believe He is working all things for good. We trust God’s sovereign control because His word says in the end, everything will be right and good. We have faith and believe God fulfills His promise to His children. Prayer glorifies God and is one way for us to exercise our faith. Ultimately, we are to pray with faith about all things. The enemy of our faith in God is unbelief and rebellion. We are living as fools when we do not seek to understand what God says. Therefore, the way we may glorify God is to believe and obey His Word. We read His Word, so that we will grow in knowledge and understanding of the person of God. The more we read, the more we will believe and trust God in all things. The second way we may glorify God is with love. We are to worship God joyfully. This verse reflects many things about how we may glorify God through love. Our relationship with God is as a marriage. It is a marriage that is a spiritual union. We are joined together with God as one. We are His and He is ours. Ours is a marriage made in heaven because it is a perfect, joyful marriage. We are the bride and our Husband makes us ready by dressing us in righteousness and holiness. Our husband loves us and cleanses us with the blood of His sacrifice. We glorify God by enjoying our relationship with Him. Worship and love are the same. When we glorify God, we have great affections for Him. Worship is a relationship based on joy. We enjoy those things we find valuable to our existence. We love that which makes us happy. When something stops making us happy, we no longer love that thing. We prioritize our lives over the things which bring us joy. Given a choice between two things, we always choose that which will make us happiest. We pursue God because we esteem Him as being valuable and essential to our joy. The fuel for our heart affection for God is His word. God’s Word helps us to gain knowledge of the person and work of God. His Word reveals the depth of His love for us. We can point to people who love God and we see that they immerse themselves in His Word. They grow in love with God through the truth of His word. Studying God’s word doesn’t guarantee worship. But, not studying God’s word will result in a lackluster relationship. There are many scriptures teaching us that we bring glory to God when we are obedient to His ways. A verse which teaches this well is spoken by Jesus. Let your light shine before men in such a way that they may see your good works and glorify your Father who is in heaven (Matthew 5:16). Jesus tells His disciples that we bring light into a dark world when we do good works before people. Our good works glorify God. Jesus teaches this truth after speaking on the beatitudes. He says those who are blessed are those who are humble, gentle, righteous, merciful, and pure in heart. It is said that imitation is the highest form of flattery. People who strive to be like God bring glory to God. When we imitate the character of Jesus, we glorify Him. When we are loving and righteous in a world of hate and evil, we give testimony that God’s ways are good. People see the outcome of our actions and see that God’s ways are right. We obey God because we believe His ways are good for our well-being. We’d rather suffer in this world rather than disobey God. There are many scriptures telling us to obey by being loving and righteous. We are to flee sexual immorality and glorify God in our body (1 Corinthians 6:20). Glorify God by being humble and striving to be of the same mind with one another (Romans 15:5-7). We are to have our love abound toward one another, approve things that are good, and be filled with the fruit of righteousness to the glory of God (Philippians 1:9-11). We are to have excellent behavior, so others see our good deeds glorify God (1 Peter 2:12). Whether we eat or drink or whatever we do, we are to do all to the glory of God(1 Corinthians 10:31). It is vital that we understand the relationship between love and obedience. Listen to the words of Jesus. “He who has My commandments and keeps them is the one who loves Me” (John 14:21). “If you keep My commandments, you will abide in My love; just as I have kept My Father's commandments and abide in His love” (John 15:10). We hear a great deal that people should love God. People will gladly listen as they are told to love God. They will agree wholeheartedly. In today’s culture of Christianity, very few people say love God and obey God in the same sentence. If you want to get a reaction, tell people to obey God. They will give excuses and you will be accused of being a legalist or of not being encouraging. Tell people they need to obey God and watch the church shrink in number. When Jesus teaches that we are to love God, we find that He tells us we need to obey God. Love and obedience are frequently in the same sentence. To Jesus, obedience and love are one and the same. We do not find Jesus saying in the Bible, “I love the Father.” He doesn’t have to say it because, according to Him, His life of obedience speaks of His love! When we encourage one another to love God we are encouraging one another to obey God. And, when we encourage one another to obey God we are encouraging one another to love God. Love is not a feeling it is an act of the will. Jesus tells us that God is glorified when we bear much fruit and prove to be His disciples. Jesus disciples are those who love Him. The way we grow in our obedience is to remember who we are before God. God is Lord and we are His servants. Those who seek to glorify God continually seek to develop an attitude of humble submission. The simplest way to say it is that we need to die to self. We need to die to our pride and selfish desires to put ourselves first. We need to die to the lusts of the flesh. We need to die to always being right. We need to deny ourselves and pick up our cross daily. Dying to self is an act of obedience to glorify God. What we need to do is to keep learning about the person and nature of God (the Trinity). The more we learn about how God loves us, and He is perfect in every way, the more we will love God. The more we love God, the more we will obey God. Students of the Bible grow in knowledge of character of God and how to please the one they love. Another way to grow in obedience is through fellowship with one another. The Bible says to fellowship with one another and encourage one another to love and good works. Iron sharpens iron. The Body of Christ sanctifies one another through fellowship and the washing of God’s word. Fellowship and studying God’s word doesn’t guarantee obedience. At the same time, not studying God’s word and not fellowshipping with the body will lead to growing out of love and obedience with God. We proclaim that which we glorify as a natural outcome of our love. Out of the abundance of the heart, the mouth speaks. There are hundreds of verses commanding God’s people to speak about Him. We are told to speak of God in the morning, noon, evening, and from day to day. We are to declare his glory among all the peoples. The Bible tells us when, where, why, and how we are to declare the glory of God. God tells us that we are chosen as His possession so that we may proclaim the excellencies of Him who called us out of darkness into his marvelous light (1 Peter 2:9). The Bible goes so far as to say suffering persecution as a Christian (1 Peter 4:16), and even dying for the gospel brings glory to God (John 21:19). The way we may grow in our gospel ministry and glorify God is to grow in thankfulness. When the ten lepers are healed, one comes back and glorifies God by being thankful. Giving glory to God and sharing the gospel comes from a heart of thankfulness. When people do good things for us, we always tell someone. Often, we can’t wait to share the good news because we are thankful. The way we grow in thankfulness is to daily remind ourselves of God’s grace and the hope we have within us. The way we may grow in our gospel ministry of glorifying God is to grow in our love and obedience. The commands to share the gospel and declare the goodness of God are plentiful. We need to obey. And, we need to help spread the love of God to the world. When we do, we bring glory to God. Let God’s glory FLOW – faith, love, obedience & witness! Everything God does is for one purpose, and that is that He is glorified. The heavens are pouring forth speech and telling of the glory of God day after day (Psalm 19:1-2). When we live for God’s glory, we join in with the stars of the universe. When we live for the glory of God, we live with great purpose. God designs us to give Him glory. Jesus says one of the reasons He came is so our joy will be full. God promises that there is great reward and satisfaction when we think, speak, and act with the purpose of glorifying Him. The trajectory of everything in the universe is that the knowledge of the glory of the LORD will cover the earth as the waters cover the sea (Habakkuk 2:14). The question we must ask ourselves is this: Is the glory of God worthy of our lives? Do we believe in God’s glory to such an extent that we are willing to live as sold out Christians? The ones who God says, well done thou good and faithful servant are those who are faithful to glorify Him with their lives.